Cake Smash are done to celebrate our baby's first year of life, however not all children like cake or maybe they have allergies. Some parents ask: What about sugars? What if they don't like the cake? or Is it better a cup cake or a cake? So fruit smash is a good option. You just have to choose the fruit your children like, I create a set up for him/her and there is no need to buy cake or go around the city looking for the perfect bakery. I was so exciting to do Carmela watermelon smash, she had so much fun and I created a special set up for this fruit lover which was a blast. So when thinking about your baby's cake smash just bear in mind you have other options with Flor Aversano photography. As always my purpose is that you and your baby have fun and as a result, tons of beautiful pictures. Here some pics from this watermelon session. Enjoy! Newborn Session: Studio vs In home. I'm often ask about the difference of doing a session at my studio or at your home. 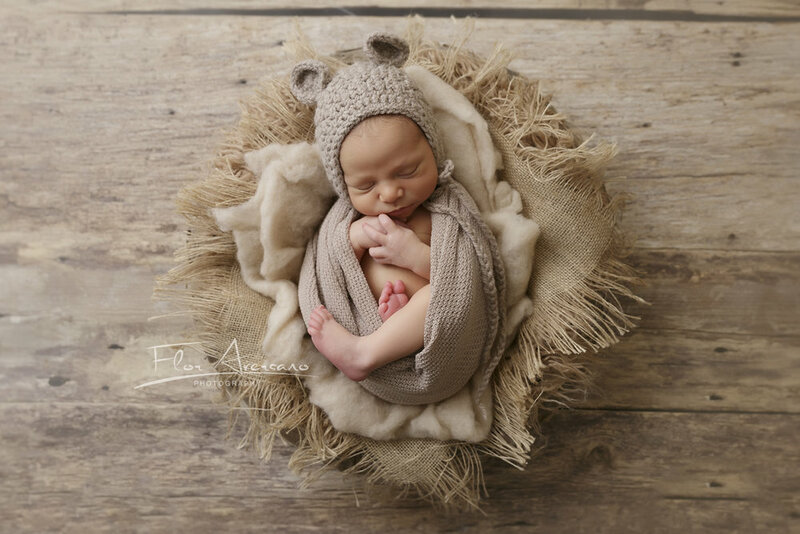 I prefer to do newborn session at my studio as I have everything I need at my hand, however I will like to mention some differences which may help your decision. 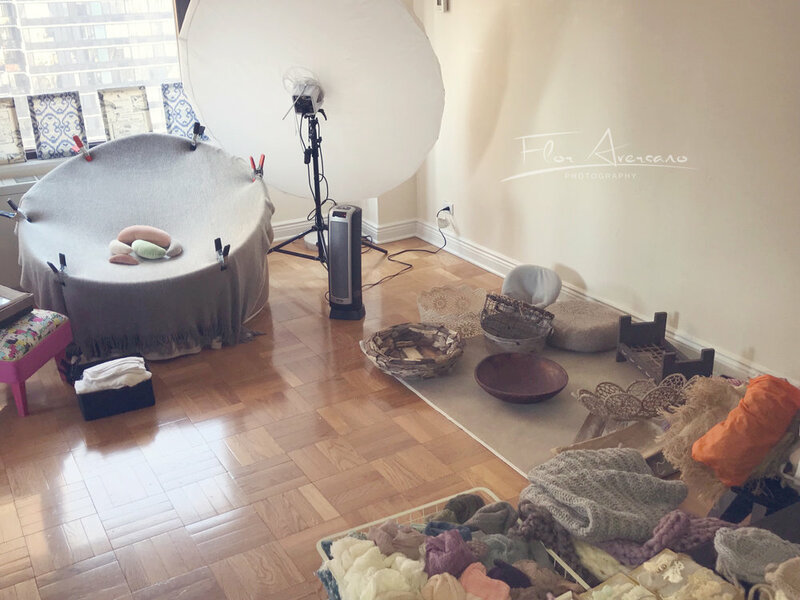 - For In home session, I bring with me some props just a few selection between buckets, wood box, posing pod, round little posing bean, rectangle trays, furs, blankets. I do not bring the wood nest or the bean bag because they are huge and heavy. However I try to simulate the bean bag with a sofa or a bed at your place... of course the results tend to be a little unpredictable. - At my studio I have everything on display so you can go around and select with my help. Of course the Bean Bag and wood nest will be here. - You might have the best light in your apartment, but New York is New York.. and when it gets too cloudy, light can be tricky. So yes I do bring one light with me just in case and I have to say is huge and will need space! - My studio is warm and nice, it has enough space for me to move around and everything I need. So you will seat comfortably and watch me in action! - At your home I need you to keep the place warm, most probably I will ask you to move some of your furniture to get enough space and transform a corner of your house into a studio. Promise I will help you clean up later! - Session won't last more than 3 hours as parents, clients and photographer... we all get tired. When I have to come and set up, it significantly cuts into our shooting time as set up might take around half hour. At my home studio everything is ready! It will always be your decision and I will be happy to do it at my studio or at your place and what is more important in both places I ensure the best photographic quality! Here are ome pics from my studio! Cake Smash are the best way to celebrate your baby's first birthday which has been so special... not only because it might have been a little tuff but specially because this little person has change your life for good. Some parents decide to do this instead of a birthday party. That's the reason why I create a unique and special setup for each baby. This way parents can have great pictures and baby lots of FUN! Cake Smash are held at my home studio on 64th & Broadway. They are usually done after baby's first nap so they are ready to play and a little hungry to eat. It last 35 minutes but you will be a total of 1hs. The session has two stages: shoot of baby with the set up, playing with O-N-E letters, standing and later with cake and the funny experience of smashing. For the end of session you can add a bubble bath... SO MUCH FUN! If you are interest in booking don't hesitate to contact me as I will make your little one and you have a great time! Fall is one of my favorite season, most parks show their beautiful colors and the city is dress up with pumpkins, leaves and halloween themes. Is a busy season for photographers as most families want to have their year session with the autumn colors and also their holiday cards. On 10/14 I did a MINI FALL SESSION with beautiful families and it was a blast! The promotion was booked in one week and every family got 7 digital images in hi-res. The weather was a little tricky, however we manage to have grate photos and what is best FUN! I might do another small promotion in November I just need to decide day. Stay tune or subscribe to our newsletter. Here some of the pictures, Enjoy! When choosing props I always consider various things. To begin prop must be SAFE FOR BABY been this the most important point. They must be stable, use excluvesily for newborn session and have the correct measure for baby to fit. I always bear in mind they are produce at smoke and pet free homes as I never know if my clients may be allergic. Most of the colors are neutral colors. I love grey, blues, green, creams, browns and off white for boys as well as mint, pink, purples and lilac for girls. All wood box, buckets, wood nest, need to be well done and no nails can be seen, of course when preparing the set ups I always layer up so baby doesn't have direct contact with the props, is comfy and safe. I also have rustic trays, fabric nest, lovely dreamweaver bowl and crochet nest. My beautiful wood floor backgrounds give the final touch together with the headbands or bonnets which are delicate and unique. I'm always blessed to have so many babies coming to my studio or meeting them at their home for a newborn session. This time I was double blessed with this two beautiful twin brothers. Liam & Luca rock their session! I was able to pose them and have them in different cute set ups which their parents have chosen for them. When doing twin session is very important to do it before they are 10 days because babies are more sleepy and still flexible making it better for posing specially being two. I create different set ups, for both baby together and also for them alone as I think that even though they are twins they should have their own pictures because they are two different persons. Love having parents assist me in this session, they are the best ones to hold babies and they both enjoy the session as they, of course are part of it. Here is a sneak pic of LIAM & LUCA, Enjoy! Newborn sessions are all about the new baby, but is also about the new family. When photographing newborn I always take the time to make beautiful photos of the whole family and photos of the siblings. Of course is a special time for that big brother or big sister which the world have totally change for them. So with patience and some tricks I get those magical pictures for their parents. But how to go ahead with a newborn session when toddlers are running around, shouting and maybe crying... when baby needs to sleep and mom to be relax so she can enjoy the session. Well it can be tough that's why before I start I have those little hands helping me, they love to be helpers! and when photo shoot begins they are the first ones to start doing the sibling pictures and follow later with the family ones. This way they are free to go and play, I can start with the baby and what is most important parents already got their precious family in a picture! This past week I had the opportunity to participate in Washington at a newborn photography workshop with the amazing Kelly Brown, Australian photographer. It was a one day course where 12 newborn photographers actualized on new techniques, talk about baby safety, exchange ideas and learn from the best photographer worldwide, it was a great experience! Back in New York with my beautiful baby clients and looking forward to introduce all the new knowledge in my newborn sessions.